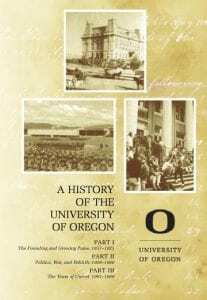 Written and produced by Rebecca Force for the Oregon Humanities Center, “A History of the University of Oregon” is an amazing story about remarkable people in interesting times. The documentary project, begun in 1999, highlights three eras of the University’s history: Part I—The Founding and Growing Pains (1857-1883); Part II—Politics, War, and Rebirth (1926-1960); and Part III—The Years of Unrest (1961-1989). Featuring an original score by Rebecca Oswald, commissioned by the Oregon Humanities Center. Available on DVD at the Oregon Humanities Center for $19.95. Contact: ohc@uoregon.edu or (541) 346-3934.